The ACT Magistrates Court originated from rather humble beginnings as the Court of Petty Sessions. The Court was established in 1930 becoming the Territory's first court with Acton House the Territory's first courthouse. Prior to the Court’s opening in November 1930, Territorians were forced to travel inter-state to Queanbeyan, Goulburn or Cooma to have their legal matters heard. Such an arrangement, according to the Solicitor-General and Secretary to the Attorney-General’s Department of the day, Sir Robert Garran, was far from ideal and “full of legal pitfalls”. Under the Seat of Government Acceptance Act 1909 State or Federal Courts had jurisdiction to settle legal disputes arising within the Territory. Due to the small number of matters that went before the Police Court in Queanbeyan and the District Court this situation initially worked well though eventually issues arose concerning the length of time it took to travel from Canberra to Queanbeyan - or with respect to serious criminal cases, to Goulburn or Cooma - as well as the expense that such travel entailed. Resolving these problems would - in part - eventually result in the creation of court facilities in Canberra. In 1926 Sir Robert Garran recommended the building of a permanent courthouse in the ACT or – if construction of permanent facilities was not economically viable – then temporary courtrooms. Unfortunately the Federal Capital Commission was not sympathetic to either suggestion fearing that a permanent building would “disrupt the geometry and design of the Civic Centre hexagon”. Moves, however, towards providing Territorians with access to their own administration of justice continued and accelerated, when, in 1929 Acton House was accepted by Attorney-General Latham as a suitable building from which the Court of Petty Sessions could conduct legal proceedings. The building was refurbished and converted for court use in the same year. The provision of courtroom facilities naturally occurred hand in hand with the realisation that the Territory would have to be provided with its own judicial officers, sitting in Canberra and possessing civil and quasi-criminal jurisdiction. In 1929 Attorney-General Brennan agreed with Sir Robert Garran’s minute seeking “periodical sittings of a Magistrate in Canberra”. In July 1930 the Court of Petty Sessions Ordinance was gazetted and the Court of Petty Sessions was established on 25 November 1930. The creation of this new court meant that the jurisdiction of the NSW Court of Quarter Sessions would no longer govern the legal affairs of Territorians though the Territory would still be dependent on visiting Magistrates for a number of years until May 1949 when – due to the ever increasing volume of work – the Advisory Council recommended the appointment of a permanent full-time Stipendiary Magistrate. In the same year F.C.P. Keane became the Territory's first resident Stipendiary Magistrate. Much later, in 1974, Charles Kilduff would become the inaugural Chief Magistrate holding this office until 1980. At first the Court’s civil jurisdiction was limited to cases not exceeding £200 and, with respect to criminal matters, to offences punishable on summary conviction. Over the years the Court's civil and criminal jurisdiction has increased to where it can now settle civil proceedings between $10,000 and $250,000 and deal with criminal offences having a maximum penalty of two years imprisonment or less and, with respect to Commonwealth matters, 12 months imprisonment or less. Offences carrying up to 14 years imprisonment may also be heard in the Magistrates Court but this requires the consent of the parties and the Court and is subject to other legislative provisions. By the 1980s, as the work load of both courts increased, problems with accommodating both the ACT Supreme Court and the Magistrates Court (the Court of Petty Sessions being renamed the Magistrates Court on 1 February 1986) in the one building became more apparent. Of the six courtrooms in the Law Courts Building half were allocated for Magistrates Court use and the other three for hearing Supreme Court matters. Additional facilities had to be found.From 1929 to 1963 the Court of Petty Sessions would move to several locations including the Acton Hotel, in 1940, and later, in April 1946, to the Jolimont Buildings in Civic. There it would remain until 8 May 1963 when, with the opening of the Law Courts Building at Knowles Place by Sir Robert Menzies, it relocated to new premises - shared with the ACT Supreme Court - at Knowles Place, Civic. Suggestions were put forward that it would be desirable to move the Magistrates Court to a purpose-built building, more appropriate to the needs of the growing Court. 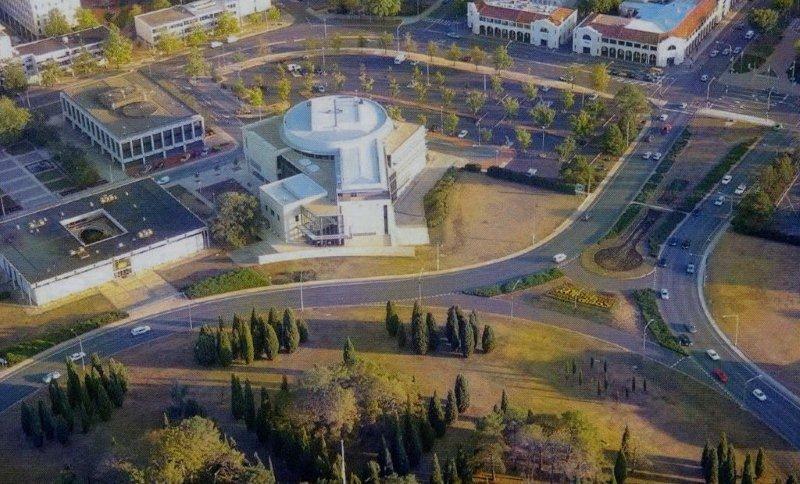 Once permission was given for the work to go ahead, local Canberra architects, Graham Humphries, Rodney Moss and Colin Stewart set about to design a courthouse that would eventually come to receive a number of awards including a major ACT award for architectural design. 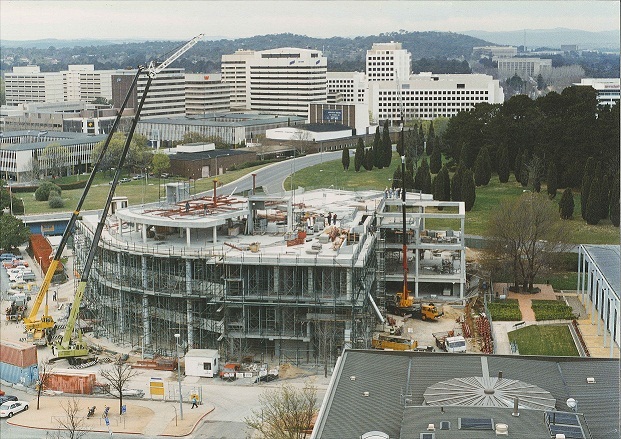 Construction of the new Magistrates Court building started in October 1994 and was completed by 1996. At its peak the project would come to employ as many as 200 people. The new courthouse is situated adjacent to the Law Courts Building and has ten courtrooms in addition to four hearing rooms. One of the advantages of the purpose-built facility is that - for the first time in twenty years - it brought together all the various functions that the Court was responsible for in the one building. Rather than having the Court scattered throughout four location in Canberra, Childrens Court, Coroner's Court and tribunal matters could now be heard and dealt with more efficiently and effectively within the one facility. 2009 ushered in the latest change to the Magistrates Court building with the relocation of the ACT Civil and Administrative Tribunal (ACAT) to its own premises in the ACT Health Building in Moore Street.